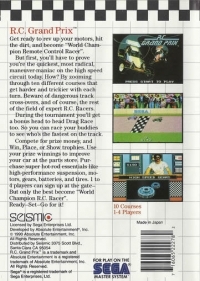 Box Text: Get ready to rev up your motors, hit the dirt, and become "World Champion Remote Control Racer". But first, you'll have to prove you're the quickest, most radical, maneuver-maniac on the high speed circuit today. How? By zooming through ten different courses that get harder and trickier with each turn. Beware of dangerous track cross-overs, and of course, the rest of the field of expert R.C. Racers. During the tournament you'll get a bonus head to head Drag Race too. So you can race your biddies to see who's the fastest on the track. Compete for prize money, and Win, Place, or Show trophies. Use your prize winnings to improve your car at the parts store. Purchase super hot-rod essentials like high-performance suspension, motors, gears, batteries, and tires. 1 to 4 players can sign up at the gate—But only the best become "World Champion R.C. Racer". Ready—Set—Go for it! 10-13-2015 herkamur Box Text Get ready to rev up your motors, hit the dirt, and become "World Champion Remote Control Racer". But first, you'll have to prove you're the quickest, most radical, maneuver-maniac on the high speed circuit today. How? By zooming through ten different courses that get harder and trickier with each turn. Beware of dangerous track cross-overs, and of course, the rest of the field of expert R.C. Racers. During the tournament you'll get a bonus head to head Drag Race too. So you can race your biddies to see who's the fastest on the track. Compete for prize money, and Win, Place, or Show trophies. Use your prize winnings to improve your car at the parts store. Purchase super hot-rod essentials like high-performance suspension, motors, gears, batteries, and tires. 1 to 4 players can sign up at the gate—But only the best become "World Champion R.C. Racer". Ready—Set—Go for it! This is a list of VGCollect users who have R.C. Grand Prix in their Collection. This is a list of VGCollect users who have R.C. 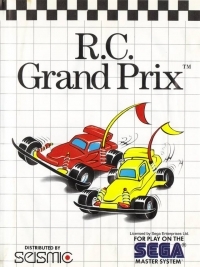 Grand Prix in their Sell List. This is a list of VGCollect users who have R.C. Grand Prix in their Wish List.